Triple Antibiotic Ointment helps prevent infections and provides temporary relief of minor burns, cuts and scrapes. Contains Bacitracin (500 units), Neomycin (3.5 mg), Polymyxin B (10,000 Units) and Pramoxine HCL (10 mg). Compares to Neosporin ointment. Neosporin is a registered trademark of Pfizer Inc. When my legs swell I get little blisters that erupt and ooze. I have to keep them wrapped when this happens. The skin is very sensitive and the blisters painful, this ointment helps to ease that pain as it heals the blisters. Good for sc. Good for sc. Good for cuts.. I apply it to cuts and sores. Husband has wound that nothing else has helped. This is a very good product. Heals quickly!. Good price. relieves pain quicklly. gentle to the skin. best I've found . on sore skin. on cuts. on anything that hurts. I have Vericose Veins &amp; use product on skin when it becomes sore - very effective! Have infections &amp; use the Triple ointment on them - very effective. 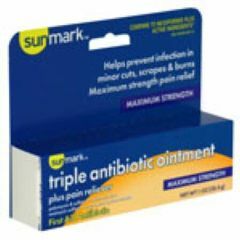 Tried many different types of triple antibiotics &amp; this triple antibiotic ointment plus pain reliever is the best by far. Does this ever come in a larger tube? I have purchased a two ounce tube before, but I don't remember the brand name.